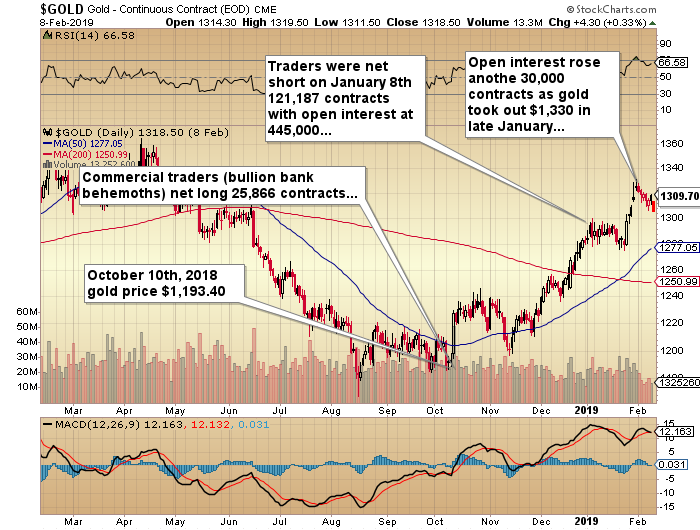 Precious metals expert Michael Ballanger discusses COT reports, the Fed, the dollar and gold. Over the years, you have all read my rants and ravings (as well as those of many other learned scribes) on the issue of government-sponsored and regulatory-sanctioned bullion bank interference in the gold and silver markets. What back in the 1970s was deemed “rank speculation” and “conspiracy theory nonsense” has now been totally legitimized by way of indictments and admissions but all with little or no remorse of any kind on the part of the perpetrators. Fines are mere annoyances and written off as “the cost of doing business” while the practices of these financial behemoths are permitted to continue to the benefit of the banco-political class and to the extreme monetary detriment of the middle and working classes, as well as those believers in the principles of sound money. With this as an introduction, observe the following graphic containing the COT report from October 10, 2018. 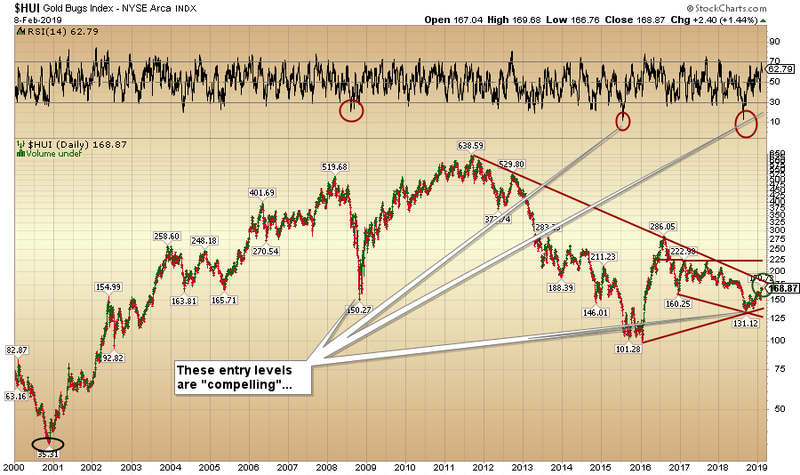 Note the extremely RARE net long position held by Commercial gold traders. 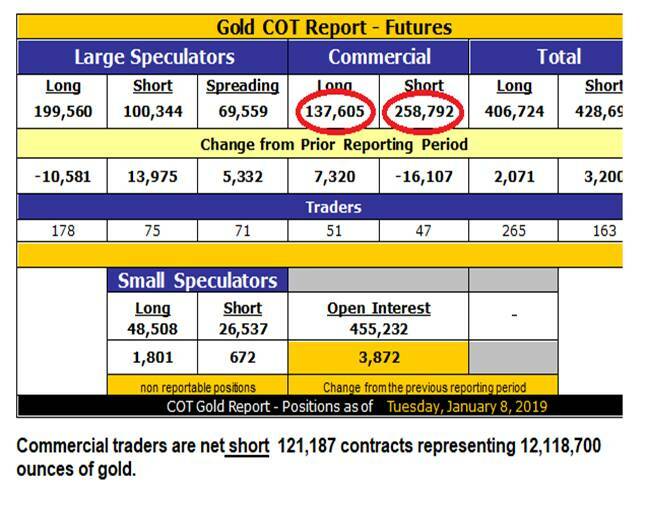 Commercial traders had amassed the largest net long position in COMEX gold futures that we followers of these data had EVER seen. The bullion banks, purported to be acting “only in the interests of their hedge book clients” (rolling eyes), had allegedly covered all shorts on behalf of their gold producer clients and actually went “net long”—but only for their clients, of course, because, after all, they are not permitted to act on behalf of their “prop book” (house account). Heaven forbid. Now, approximately three months later after a global stock market panic, a major reversal in bond yields and a sharp drop in the U.S. dollar, gold prices found their way to $1,300/ounce just after New Year’s before settling back to $1,289.50 by the time the January 8 COT is released showing a—(large drum roll please)—147,053 contract swing in positioning with the Commercials going all out to cap the gold advance by issuing paper gold with a notional volume of 14,705,300 ounces, which is approximately 16% of global gold production. The MSM and the regulators see this as a “completely normal” occurrence… (jaw drops with a loud THUD onto the floor). Because of the U.S. government shutdown, we are being intravenously fed the catch-up COT numbers so we are still a month behind. However, the open interest figures show a net reduction of approximately 10,000 contracts from October 10 to January 8, which suggests that the Large Specs and the Commercials were engaged in serious role reversal therapy of sorts. 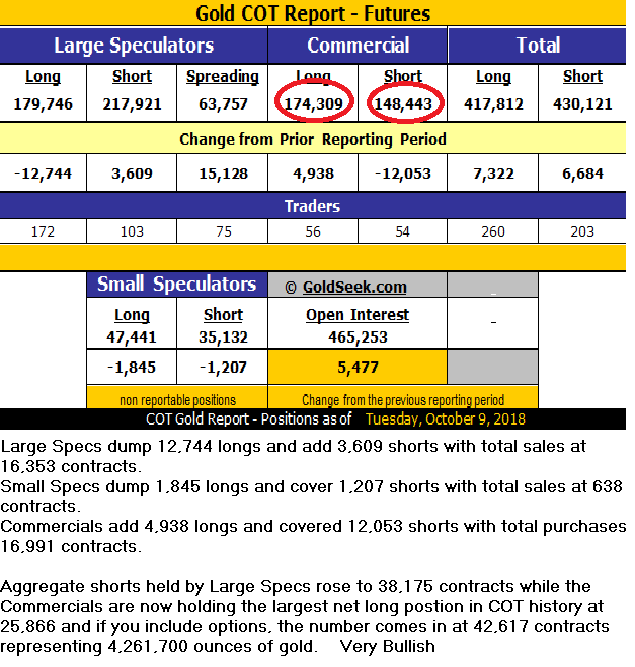 Then in the last 30 days, open interest shot higher (+35,000) with the gold price reaching the magical $1,330 level. 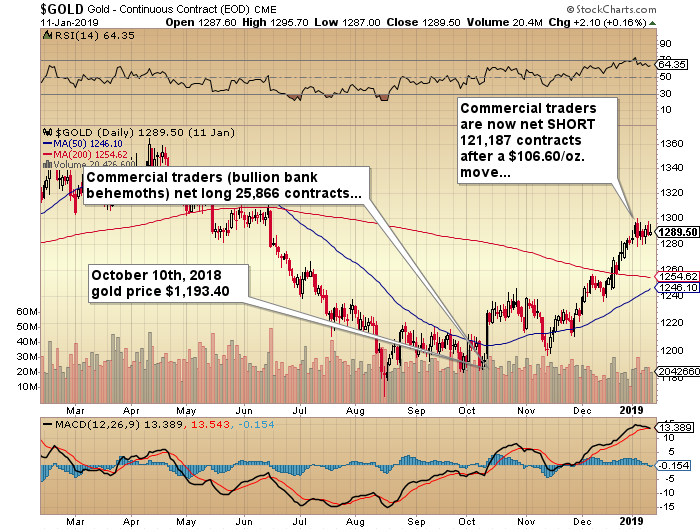 It doesn’t take a rocket scientist to deduce that the Commercials continued to feed just enough phony, counterfeit, “paper” gold into the COMEX so as to mollify the supra-$1,300 move and set up the corrective behavior of the past fortnight. As maddening as it is, it is no surprise to any of the followers of this publication but what IS curious is that the capping exercise fits perfectly with the about-face in Fed policy so blatantly broadcasted and laser-targeted to rescue stocks. 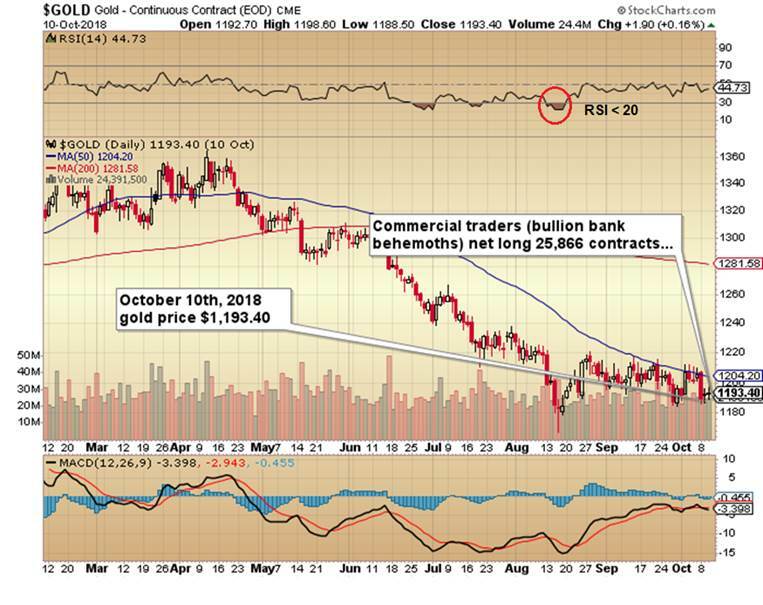 Furthermore, despite the fact that technical analysts find themselves apoplectic over this statement, all “technical breakouts” in gold should be sold and the more perfect the “technical set-up,” the more aggressively one should sell. As an aside, the use of the Relative Strength Index or “RSI” has been a tool that I have used for years as an aid in market execution and timing. However, along the way, through some proprietary augmentations to the index, it has served quite well in identifying major tops and bottoms, with its effectiveness somewhat greater after extended declines than after advances. By example, RSI can stay elevated above the 70 (“overbought”) for an extended period while prices continue to rise but rarely have I seen an RSI stay under 20 for more than one day. The gold miners have been awful investments for most of this decade with only a brief 8-month rally in 2016 providing anything close to the returns of the prior decade that saw the HUI advance from 35 in 2000 to 638 in 2011. To be sure, there were some smart rallies such as 2012 (372 to 529) and 2016 (99 to 286) but by and large, owning the gold miners has not been a rewarding experience. Nor has owning the juniors or the micro-cap exploration issues been any fun either, as the TSX Venture Exchange still sits in a coma-like trance, roughly 18% of its 2007 peak. When you consider that TSXV administrators have replaced a great many junior resource exploration companies with crypto and pot deals since 2011 and that both of the latter had enormous moves, to be sitting at 611 is an unabashed embarrassment. 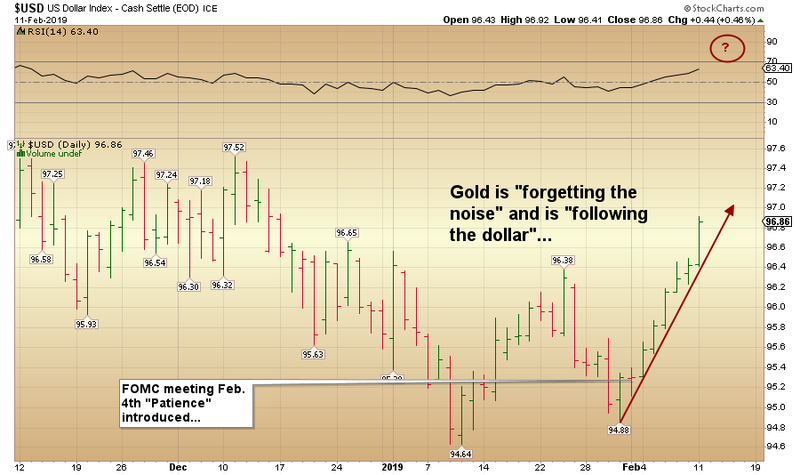 On December 20, I penned a missive entitled “Forget the noise; follow the dollar” in which I suggested that one would be well served to ignore the technical picture and the surrounding media crush surrounding the stock market crash and instead pay close attention to the U.S. dollar. The truth is that there was only a modest correlation between gold and the U.S. dollar in December, but since the onset of 2019, that correlation has returned with a vengeance. Pricing pressure has accelerated since the Fed introduced the word “patience” during the Feb. 4 FOMC meeting and that is interesting because monetary policy deemed “dovish” is supposed to wreak havoc on the associated currency. However, in keeping with the fact that are no longer any tried-and-true “rules” upon which to anchor one’s trading system, declining U.S. Treasury yields are not deterring FOREX traders from bidding up the $USD, an aberration by any stretch. Accordingly, gold and silver are acting as if the Fed is actually accelerating its quantitative tightening and about to torque up the balance sheet reduction exercises. As bizarre as it all seems, nothing but nothing surprises me anymore and while I am carrying a larger-than-normal percentage of physical bullion versus shares or futures or options, I refuse to tamper with the physical and instead hold an equally large cash position in anticipation of a return to the GLD and SLV call options which I exited on January 30. While I would love to get another shot at those calls where they were back in late August, I doubt whether I’ll see an RSI under 30 prior to the next tradeable rally in the GLD or SLV. I am instead going to see if the $USD index can show an RSI above 70 this week (63.40 now) which may just trigger the resumption of the downtrend in the U.S. currency, which (assuming that the gold/dollar correlation holds) might signal my entry point for the leverage plays. The reality underlying my trading acumen lies in the timing of arrivals and departures of both my partner and my dog. There is a 1-1 correlation between gold and silver downtrends and the sleeping quarters of the other two inhabitants of this house. From August until late January, life was normal with Fido sleeping under my desk and my better half in her usual weekly routine (of looking after Fido and me) but in the past two weeks, the house is silent except for the sound of crashing monitors, splintering chairs and disintegrating wine bottles. The dark-colored tone of my rage-filled language and the decibel level of protest against bankers, incompetent stock exchange administrators and the bullion bank behemoths has rendered this humble abode devoid of company either animal or human. With a wicked winter snow storm on the horizon, I long for a return of declining greenbacks, rising precious metals prices and most importantly, hot food.